What does a self-respecting Texan do when the heat index is in the 115 degree range? Step one for many is to rekindle relationships with family and friends who live up north. That doesn’t mean giving up on trailering a boat, fishing for some different species or living the outdoor life either. To check out that premise, I recently took a 3,000 mile roundtrip to the part of Michigan that lies just over an hour outside of Chicago. The destination was Union Pier, a beach community surrounded by others, all offering public beaches and good fishing opportunities, as well as temperatures that generally linger in the low to mid 80s during the day and mid 60s at night. Think of it as a Texas April or November. Our ride needed to be comfortable and substantial for the very long trip which included two nights on the road each way. We wanted to be sure that it was equipped with the latest in infotainment, navigation and technology; and decided that three rows was a must since we expected to transport more passengers and gear when we arrived at our destination. 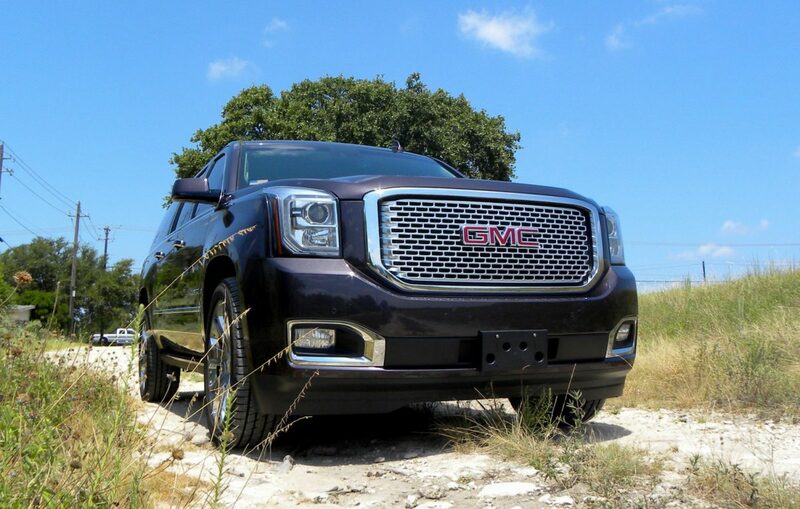 Our perfect pick: the 2015 GMC Yukon Denali 4WD XL. We didn’t haul a trailer, but easily could have since the Yukon Denali is rated at 7,900 gross vehicle weight with 4WD, and a very respectable 8,100-8,300 lbs. for the 2WD versions. Trailering equipment, trailer brake controller, trailer sway control and other relevant features are standard on this vehicle. Payloads vary with certain specs, topping out at more than 1,600 lbs. for the 2WD edition. With a 31.5 gallon fuel tank, we were able to keep fuel stops to a minimum, even with the 14 city/20 highway/16 combined numbers. We exceeded those numbers, and with the standard engine would have done even better. 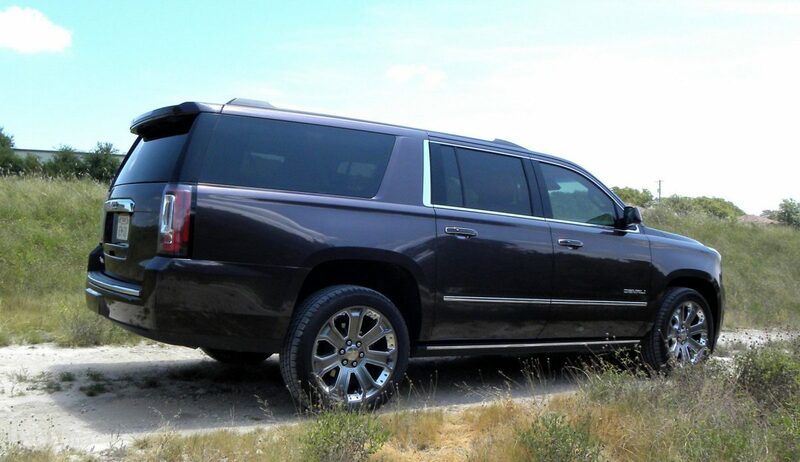 The Yukon Denali XL is built at GM’s Arlington, TX, facility, along with its Chevy and Cadillac versions, and it is still body-on-frame which is a highly desirable construction for a vehicle of this size. 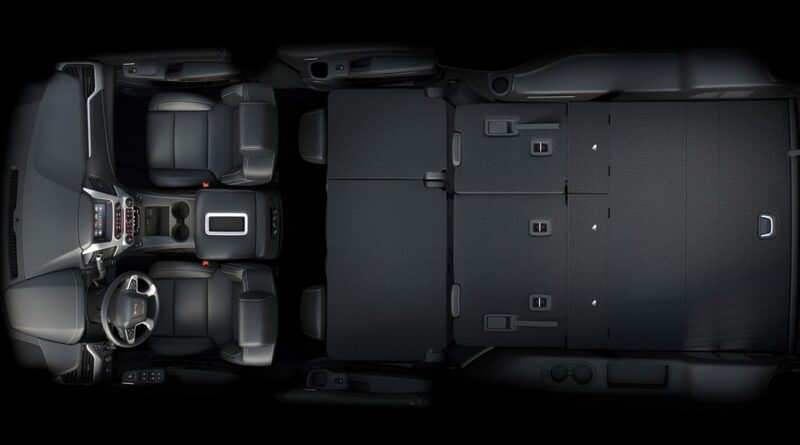 The real reason that someone opts for this kind of vehicle is the interior space, and the Yukon Denali doesn’t disappoint. Going north we filled the storage compartment (including the third row space) with enough household goods to stock a cottage, as well as an 8-person tent. It was a mighty load and everything fit without compromising sight lines for the driver or front seat passenger. While we were there, we carried six or seven passengers routinely, along with outdoor and beach gear, lots of food and beverages, and two dogs. Verdict: it could handle everything and never felt sluggish no matter where we drove. I especially loved the power liftgate which can be used hands-free or with the key fob, and featured a programmable liftgate height. 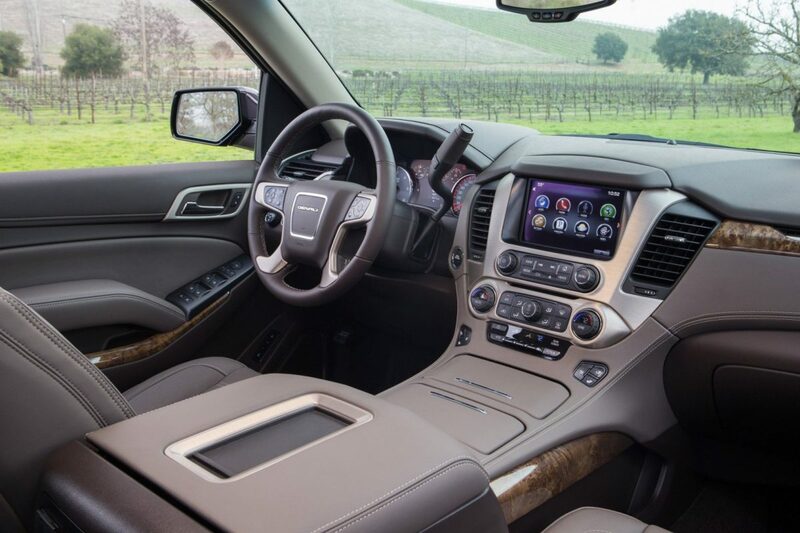 There is a reason why people love the Denali interior. It has all the SUV DNA that a consumer could want (nothing wimpy here) and never felt anything but luxurious with great quality materials, fit and finish. As with all recent GM products, the cabin is as quiet as anything in the marketplace. When developing the 2015 Yukon, GMs engineers strengthened the steel frame, and created new mounts that act as shock absorbers and noise dampeners. New inlaid doors feature tighter triple-seal doors and additional seals were added around latch and outside door handles. There were added sound baffles, acoustic glass and other features that provide a total sound control package that dazzles. 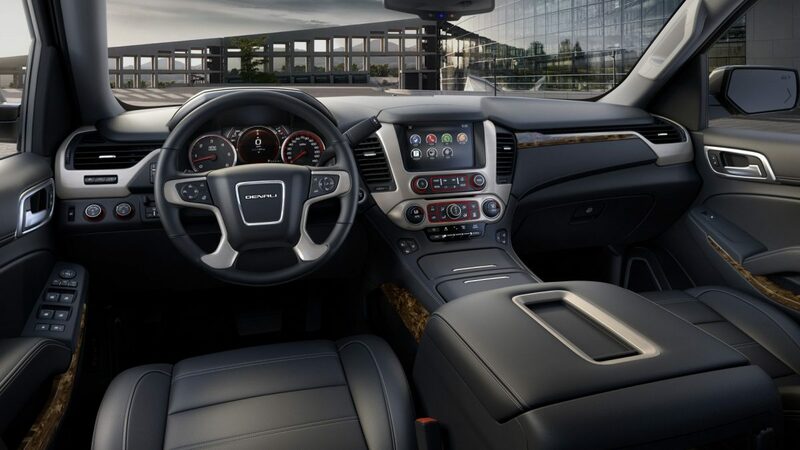 For nav and infotainment, the Yukon Denali features GMC Intellilink. There is an 8-inch touchscreen that doesn’t take a techie to use. Bluetooth is onboard and you can pair a phone easily as well as using voice recognition to use your smart phone for Pandora and Siri EyesFree apps. Another feature that continues to impress is the integrated 4GLTE hotspot that is being introduced on most GM vehicles as they are being introduced. 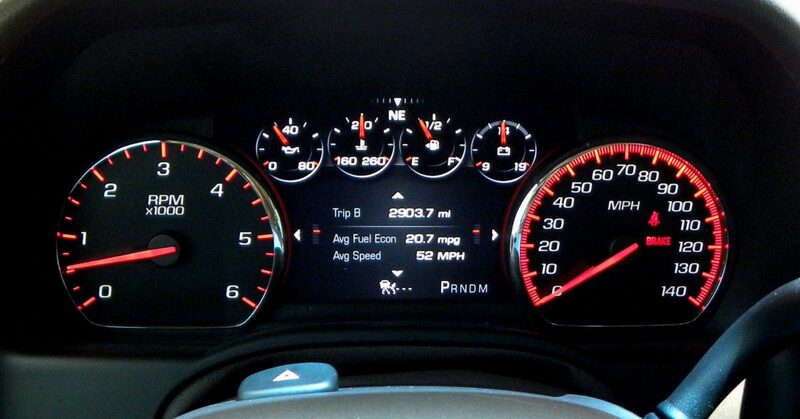 (They are standard, for example, on the Chevy Colorado and GMC Canyon mid-size trucks.) For a trip like this, the hotspot enabled the use of an iPad for the entire trip — great for finding restaurants, fuel, hotels and other points-of-interest. Were we looking for boat rentals, bait or other outdoor activities we could have easily found them. I have been a strong proponent of OnStar since it was introduced, and, while it has evolved over the years, I still encourage drivers who have it in their new or used vehicles to subscribe. The safety aspects are exceptional, and all it takes is a single problem — even one as simple as a lockout — to make you a believer. It is one feature well worth its annual cost. While our drive back to Texas didn’t have the payload, extra passengers or other challenges, it had to accommodate tired travelers looking for an easy ride. The Yukon Denali delivered on that, too. 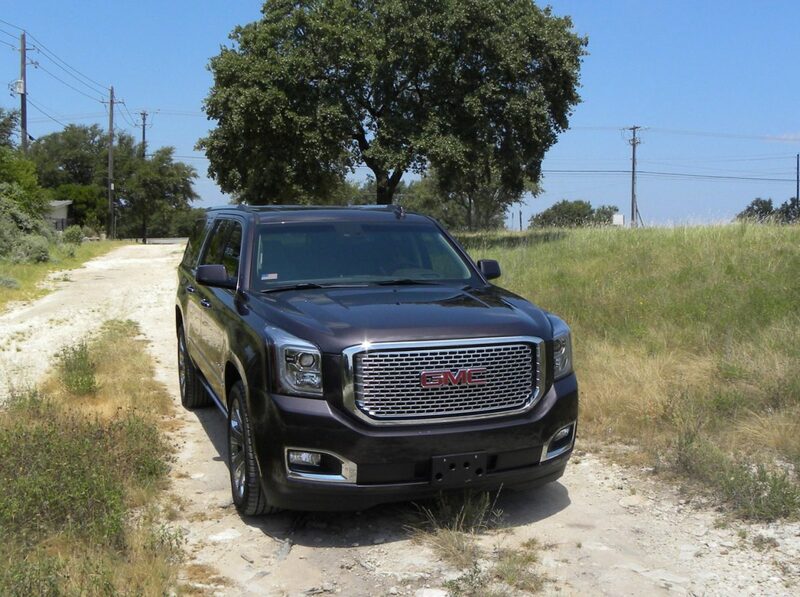 Since this was an all new vehicle for GMC for the 2015 model year I don’t expect to see many changes for the 2016 model year, so feel free not to wait.